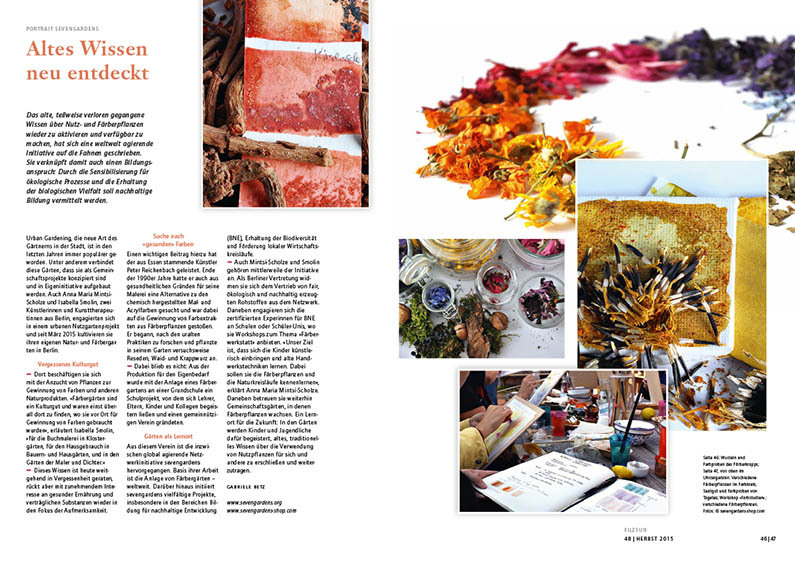 Like autumn, this issue of the filzfun is filled with a colorful variety and treasures of the ever-creative felt world. 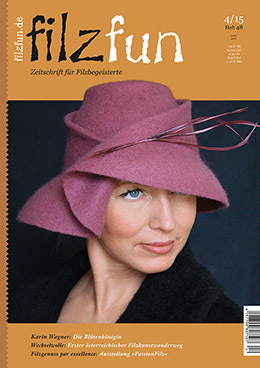 The cover is graced by a unique hat creation made by the Russian felt artist Irina Spasskaya. Her headpieces can be called real gems. With a precise laying technique she creates a wonderful fine and smooth felt, that she transforms into a seamless, weatherproof, individual headpiece. 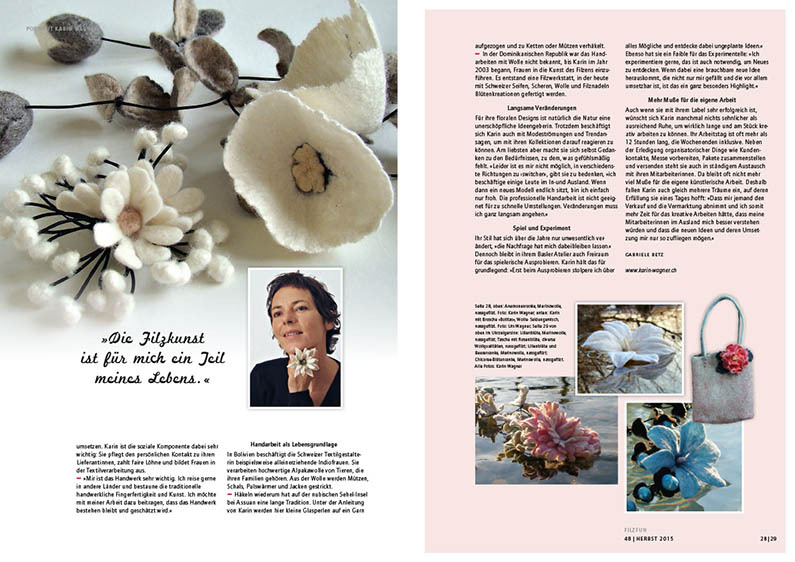 Real pieces of jewelry for women who love something special are the soft and poetic flower creations by Karin Wagner. A necklace of felted wild roses, an orchid brooch or a bracelet with rose hips – all accessories have been made with great love for detail. The experiment plays a great role for Petra Bartels. The Italian based artist loves the artistic process, the moments of surprise and chance and she does not shy away to form the hairy felt with the form fiber of plaster. Janika Saar from Estonia loves rich colors, vibrant shapes and noble embroideries. Her dresses and coats are based on used knitwear and they enwrap the body, after Janika’s recycling procedure, like precious body wraps. 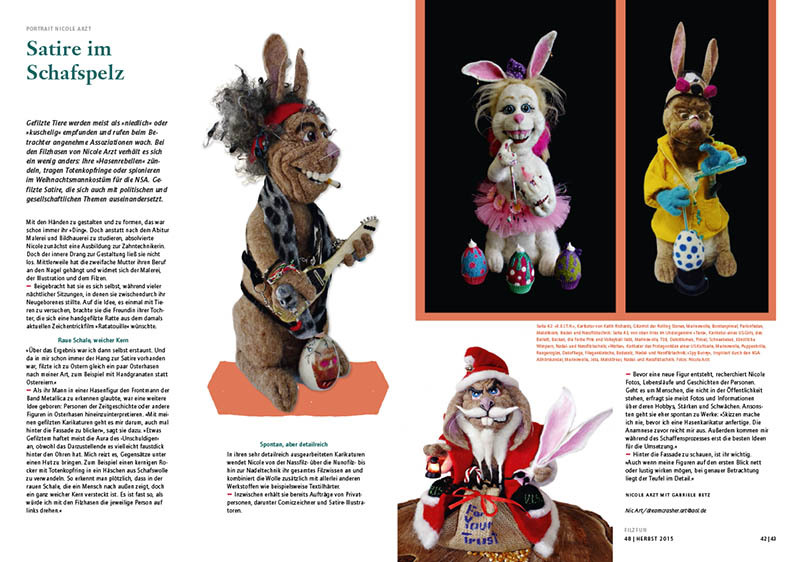 The satiric »Rabbitrebels« by Nicole Arzt show how diverse the appearances of felt can be, as well as the many stations of the first Austrian felt art trail, that opened in June 2015 in Kirchberg am Wechsel. Lea Rombold, the first felt designer with a journeyman’s examination in a dual system thinks felt is the most amazing craft in the world. Kathrin Wegener has ventured on a real adventure and felted a carpet with the help of her sons and friends aswell as with the help of real horsepower. 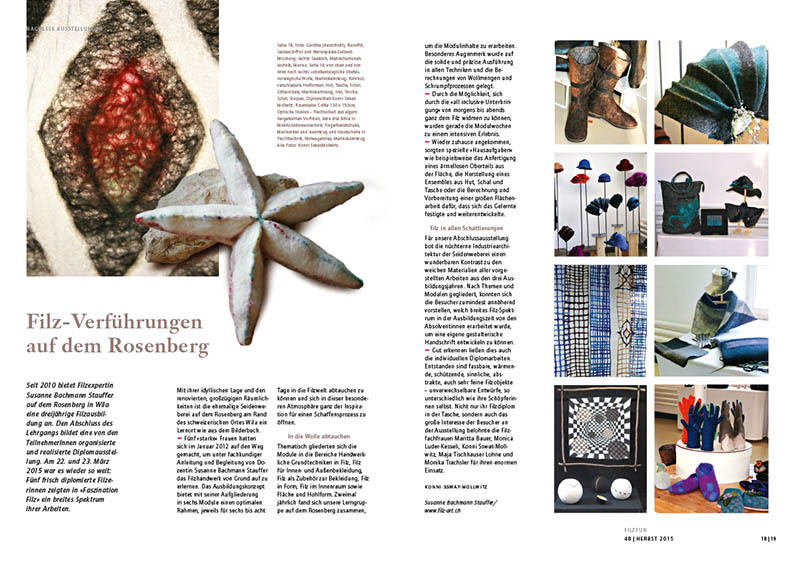 final exhibitions of the graduates of the felt education in Ballenberg and Wila/Rosenberg show the enormous variety and quality creations with the medium felt. In a special show the International Textile Festival in the Dutch Leiden presented wearable felt and the IFA conference in the English Aylesford had a great program of workshops and master classes. At the same time of the opening of the felt art trail in the Austrian Kirchberg am Wechsel there was a lovely festivity about sheep and wool. The workshop reports review two workshops where participants learned a lot about eco-printing and the development of individual patterns. From sheep over wool to the finished felt product – for Sven Kaczmarzewski it is a process that he is a part of from beginning to end. We also look over the shoulder of a professional shearer. 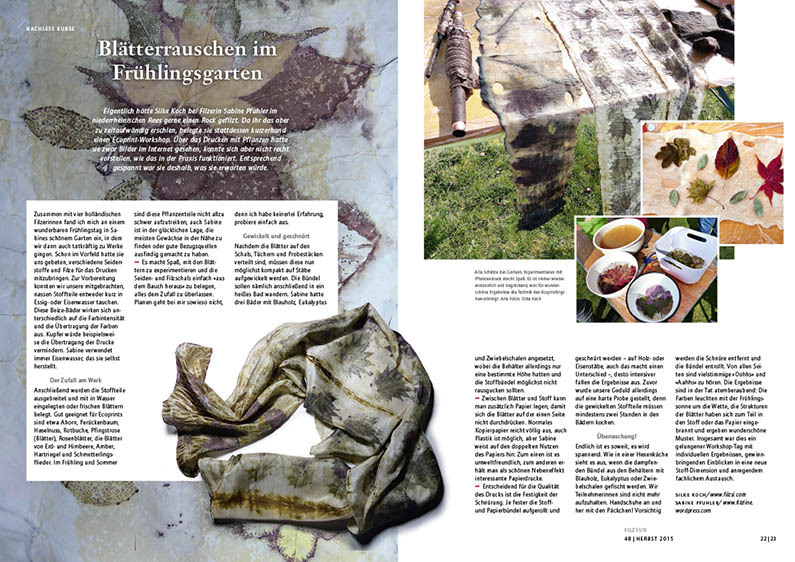 The textile artists Olga Kazanskaya and Dina Ronina present an interesting dyeing technique that includes eco-printing and batik and produces beautiful results, have a look at the special instruction for our readers.